Lucknow has been on my travel list for few years. The patrons swear by its gastronomical delights and I wanted to try those culinary gems. When husband asked me to join him for a trip to the city of nawabs, I quickly booked a flight and a hotel to Lucknow by using my credit card through a travel website. It’s so easy to book a holiday these days. I have realized that online shopping with credit card is safer than carrying cash, especially for travel. February was a perfect sojourn, not very hot, neither too cold. Wedding was a perfect reason to indulge. We stayed at the Radisson in Lalbaug which was a walking distance to Aminabad and Hazratganj the hub of shopping and eating. Chowk wasn’t far either at 4.5 kms from where we stayed. The city attractions like Bada Imambara, Chota Imambara and Presidency are near to the chowk. Ola and Uber were easily available. In fact we also travelled in the E Rickshaw and pedal rickshaw to beat the traffic. The lanes are narrow at few places so you should be prepared to walk. But let me get back to what we ate in Lucknow. Here are 15 delicacies that you will find in the city of nawabs. Let me break this into different meals so that you can plan your gastronomic journey well. If you are keen to have local food for your breakfast and not the usual hotel fare then start your day with Sharmaji ki chai located near Lalbaugh. He also serves round samosa (usually they are triangle), potato filled deep fried crispy snack that is typical to Lucknow. Travel to chowk to taste to most fluffy and soft, melt-in –the-mouth delicate dish called Makhan Malai. I am not exaggerating but that’s the lightest dessert I ate in my lifetime. Before you know it, it’s over. Cream, flavoured with kesar, rose water, etc., hand-beaten to create the most light and fluffy texture, lightly sweetened. It is said that the chefs keep the cream overnight to collect the morning dew and then hand beat it to create Makhan malai. Only available during winters and that too in the morning. Rahim’s shop is in one of the narrow lanes in chowk where cars cannot go in. So get down at the chowk and use GPS to navigate your way to Rahim’s Kulcha Nihari. It is one of the most popular breakfast or brunch items in Lucknow. The crispy fluffy kulcha and paya nihari is very delectable. It is very heavy. Was able to finish only one kulcha. But it is the best thing that I ate in Lucknow. Rahim’s shop is basic and is not very clean but is super busy. Pay attention while you are searching for the shop, as you might pass through without noticing the entrance of the shop. If you are a vegetarian, you can try the famous Chole Bhature at Shree located at chowk. The deep fried bread served with spicy chickpea curry. Their lassi is also popular. Post that go for site seeing, as the famous landmarks are nearby. Take an e-rickshaw or walk down. You need to digest all the good food you ate, remember! Come back to chowk for some more food. It is again a shanty near the chowk which is always busy with die-hard fans of Dum/Awadhi biryani. You need to sit on the roadside to eat the most famous biryani in town but you won’t regret the experience if you love Dum biryani and mutton korma. You can see live how they cook the stalk, gravy and biryani in the big utensils on coal stoves. The consumption is steady so they are cooking something or the other always. The food is not fancy but fresh. The biryani is not greasy, it is full of flavor and is prepared in the authentic Awadhi style. If you love your afternoon tea, then you can try the famous tandoori chai in the same area. Clay cups are kept hot in a tandoor. After preparing tea/masala chai in a traditional way they pour the liquid in the hot clay cup that infuses the flavor of mud/clay in the liquid. It smells like the first rain, when rain drops drench the earth. The frothy Tandoori chai is served in a clay cup. Not to be missed if you are a tea lover. Go for some more site seeing as everything closes by 6 pm. Moreover, you need to walk if you want to eat some more in the evening 😉 Else go back to your hotel to get some rest. The spicy tangy Tokri Chaat is very filling and bursting with flavors. Green chutney made with mint and coriander, red chutney made with tamarind and spices, pomegranate beads, yogurt, filled in a savoury deep fried basket made up of lentils and flour. A lentil ball called vada sits in the centre absorbing all the liquid. It’s crunchy, spongy, sweet, savory, and spicy with bits of ginger and green chilies, a riot of mouth-watering flavors. A must try. You can also shop for Chikan work and leather goods at Aminabad which is cheaper than chain outlets. Pink Kashmiri chai, which is available only in Lucknow (not even in Kashmir) is flavored with cardamom, saffron, kewra and dry fruits. Rich in aroma and taste, you feel the affluence in the cuisine that was majorly influenced by the nawabs. You can try it in many places across Lucknow. I tried it from a street side vendor in Aminabad. Very unique! Shopping might make you a little hungry. So grab a quick bite from a road side stall/thela selling barbequed liver and boti kebab. Absolutely fantastic barbequed liver and boti served with green chutney. Liver was better than the boti I felt. Relished every bite. And it was not at all expensive. I strongly recommend this. Yes, you save the best for the last. The last meal of the day should be special and you cannot go wrong with the famous Tunday Kebabi, the original shop in Aminabad which has now seating arrangement across 2 floors. They do serve biryani and other dishes but people throng their shop for the soft and delicious kebabs with mughlai parontha (fried version of roomali roti). That’s their USP. The porontha goes very well with the soft mutton and beef kababs. You can also order for sheermal or tandoori roti with the kebabs. Else you can choose to eat tandoori chicken with roti/porontha at Dastarkhwan at Lalbagh if you prefer fine dining. If you still have some space left in your tummy then do try the special lassi at Ram Mishtan Bhandar, two shops away from Tundey Kababi in Aminabad. The lassi is delicately sweet and it was garnished with dry fruits and white butter. Very delicious! The dessert options are endless in Lucknow, starting from gajar-pak (carrot pudding), to rabri with jalebi/emarti, to malai gilori, to flavored kulfi’s, to shahi tukda (bread pudding), to firni. But I have listed the most popular desserts here that you can try. You can find local halwai or sweet maker selling sweets on the streets of Aminabad. Try the shahi tukda or special tukda which originated in Lucknow. It is a bread pudding served with thickened milk and dry fruits. You can try kulfi, frozen dessert served with falooda, noodle like condiment garnished with flavored syrups. 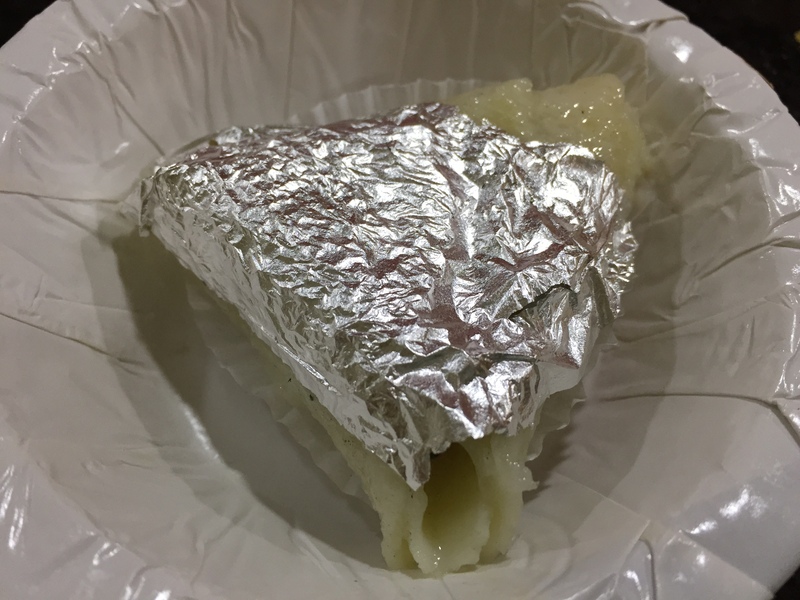 You can end your food journey with Malai Pan. If you are not very fond of the traditional pan then this is an alternative to cater to your sweet tooth. Fresh paper-thin sheet of malai (cream on top of milk) stuffed with mishri, dry fruits, saffron, and sugar with a dash of rose water and kewra. Complete indulgence and loaded with calories. I hope I was able to cover most of the exquisite dishes available in Lucknow. If I missed something, do leave your suggestions in the comment section below. In the typical Lucknow style, I say ‘nosh farmaiye’ which means bon appetite, whenever you are in the city of nawabs next! Tagged awadhi food, food to eat in Lucknow, Incredible India, Rahim's Kulcha and Nihari, Tunday Kebabi.